Success! Olivar from Uganda raised $249 to fund hernia surgery. Olivar's treatment was fully funded on January 18, 2019. His hernia treatment was successful. He will no longer experience pain and will have improved quality of life. He is no longer at risk of the hernia twisting or blocking. Olivar is a businessman from Uganda. He is the oldest of five children. For one year, Olivar has had a scrotal hernia. If not treated, the hernia may result in intestinal tissue damage and death. 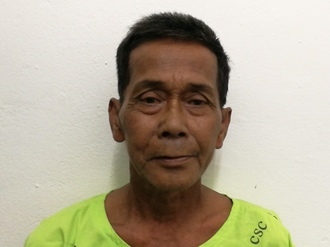 Fortunately, on January 16, he will undergo hernia repair surgery at our medical partner’s care center. Our medical partner, African Mission Healthcare Foundation, is requesting $249 to fund Olivar’s surgery. Once completed, this procedure will hopefully allow him to live more comfortably and confidently. Olivar's case was submitted by Joan Kadagaya at African Mission Healthcare Foundation in Uganda. Olivar was submitted by Joan Kadagaya, Curative Medical Support Program-Partner Representative at African Mission Healthcare Foundation, our medical partner in Uganda. Olivar's profile was published to start raising funds. Olivar received treatment at Holy Family Virika Hospital. Medical partners often provide care to patients accepted by Watsi before those patients are fully funded, operating under the guarantee that the cost of care will be paid for by donors. Olivar's treatment was fully funded. Olivar's treatment was successful. Read the update. A hernia occurs when a portion of the intestine protrudes through the lower abdominal wall, usually for one of two reasons. The first is a congenital abnormality in which the tissues did not close. The second is excessive stress in an adult, often due to heavy physical labor or pregnancy. Patients experience a bulge or lump in the affected area. The hernia may cause the patient to feel pain, discomfort, weakness, pressure, and sensations of heaviness or aching. These symptoms are often exacerbated when the patient coughs, bends over, or lifts heavy objects. In some cases, hernias have no symptoms and are only detected during routine medical exams. Patients with uncomplicated hernias may experience only annoyance or discomfort. As the hernia opening expands, the discomfort will increase. Small openings are more likely to trap the intestine, potentially leading to intestinal damage or death. Hernias are common in Africa. People often do very hard physical labor and lift heavy objects. Women tend to have more children than those in the United States. It is possible that some hernias have infectious or genetic causes. Surgery lasts for three to eight hours, depending on the age of the patient and the severity of the hernia. The patient will stay in the hospital anywhere from two days to eight weeks, again depending on the age of the patient and the severity of the hernia. The patient is continually monitored. Treatment is curative. The chance of intestinal strangulation or bowel obstruction reduces significantly. Hernia repair is not a risky procedure, and it comes with few side effects. Many patients will ignore a hernia until it becomes uncomfortable and seek care at that time. Some people will wear tighter pants or a tight band around the waist to prevent the intestine from protruding. If the hernia is not “stuck,” patients tend to ignore it and adapt to living with it. However, this could lead to future complications. Nan is a 67-year-old rice farmer from Cambodia. He has six children, seven grandchildren, and enjoys listening to the monks pray on the radio in his free time. One year ago, Nan developed a cataract in his left eye, causing him blurry vision and photophobia. He has difficulty seeing things clearly, recognizing faces, and going anywhere outside. When Nan learned about our medical partner, Children's Surgical Centre, he traveled for three and a half hours seeking treatment. On April 22, doctors will perform a phacoemulsification surgery and an intraocular lens implant in his left eye. After recovery, he will be able to see clearly. Now, he needs help to fund this $211 procedure. He says, "I hope that after my surgery is complete I will be able to rejoin the ceremonies at the pagoda." Kyomugisa is a businesswoman from Uganda. She is a mother of four children. Kyomugisa has had a swelling on her right thigh for two years. If not treated, the mass may make it difficult for her to walk. Kyomugisa traveled to our medical partner's care center to receive treatment. On April 17, surgeons will remove the mass. Now, Kyomugisa needs help to raise $196 to fund this procedure. She says, "After surgery I will resume with my business."